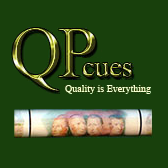 My name is Ronnie Powell and I am the founder of Que Perfect Billiard Cues. I was born in the late 1940's and grew up in East Tennessee. I started working in a rough billiard room at 12 years of age and by the time I was 14 years old I was shooting for the owner. When I built my first cue I purposely did something that I figured would get more feel (feedback) to my shooting hand. It worked, but it also gave much more spin on the ball! An unexpected bonus! I applied for a patent and patent protection the week of June 9, 2002. When conducting tests against other cues I allow the owner of the brand name to shoot their cue and then THEY also shoot my cue. I do not shoot it against their cues, they shoot it against their cues! So far it has not lost and it has shot against some big names.